Whether you’re a developer, writer or you just want to collaborate on documents for an important project, git (and Github) has become an essential tool for many people. Still, in its raw (command-line) form, git is relatively hard to use and understand even for people who can create an iOS app with ease. 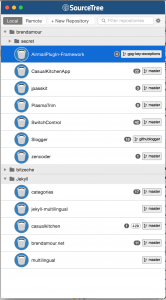 Luckily, there’s a myriad of git tools out there who aim to simplify and visualize the process of creating, committing to and updating a git repository. 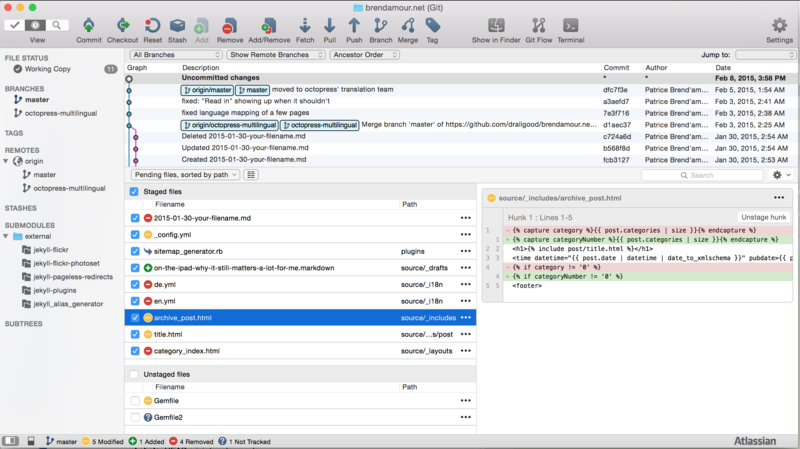 One of those tools, and by far my favorite, is SourceTree by Atlassian. 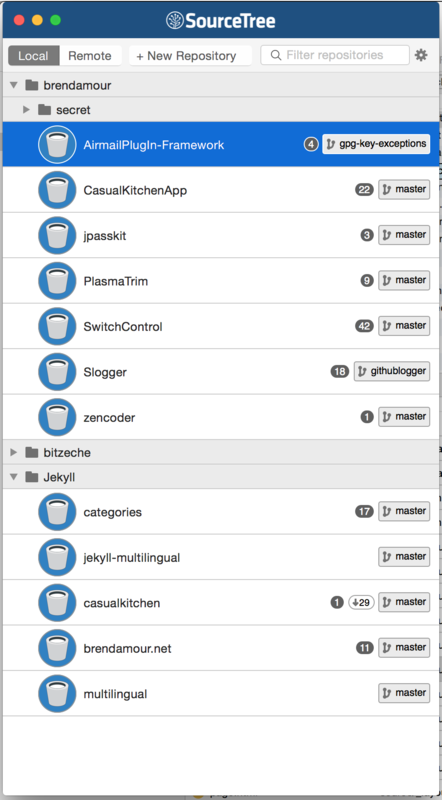 In fact, I even use it when the App I’m working in right now has native support for git. It’s that good! 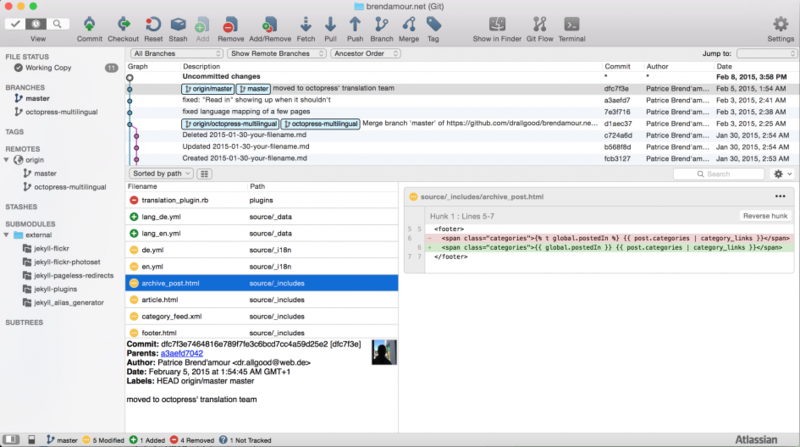 SourceTree allows you not only to maintain a large library of projects, but also keep track of new commits and local changes. The change visualization is really useful and even without knowledge of how git really works you can start contributing to a project in mere minutes. Even creating new projects or checking our existing ones is as easy as a click of a button. In addition to connecting to any git repository, it comes with enhanced support for the biggest git hosting-services out there (Github, Bitbucket and Stash). No need to hunt down the URL to one of your Github repositories as you can just pick it from the list. SourceTree is available from Atlassian for free, but requires registration. As for why you’d want to use git for your project: Stay tuned, we’re working on an article about that right now. 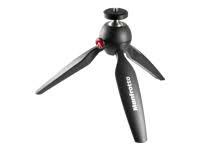 My pick for this week is a rather simple tool that can be utilized in many different ways: The Manfrotto Pixi. This mini-tripod with a 1/4″ screw allows you to mount a plethora of different devices. Everything from mounting a light for a photo shoot to mounting a microphone to record audio can be accomplished with this little wonder. You are even able to, get ready for this, mount a camera on it to stabilize the camera move it into a more favorable position. By closing the legs of the tripod, you can even use the Pixi as a way to hold the camera in your hand while you are taking a photo or recording some footage. While the tripod is in this configuration, it can also be used as a grip for a microphone. I have used the Pixi in many of these configurations and for $24-30, you cannot go wrong. The compact nature of this tripod also makes it easy to stash it in a bag, purse, or any other storage container you might be bringing with you. The build quality is a nice, hard plastic and looks like it can take a bit of abuse before it has to be replaced. All in all, this little Pixi packs quiet a punch and can be a professional’s essential tool. Enjoy! As any creative minded individual knows your best ideas come to you and the most Inconvenient times. For many of us that time of totally relaxation and clarity comes in the form of a long hot shower. The enemy of great ideas, sparks of brilliance and whit is the lack of something to write it down for later recollection or better yet action. AquaNotes are the answer to this dilemma and never again do you have to let moments of ideation go to waste with the bathwater. 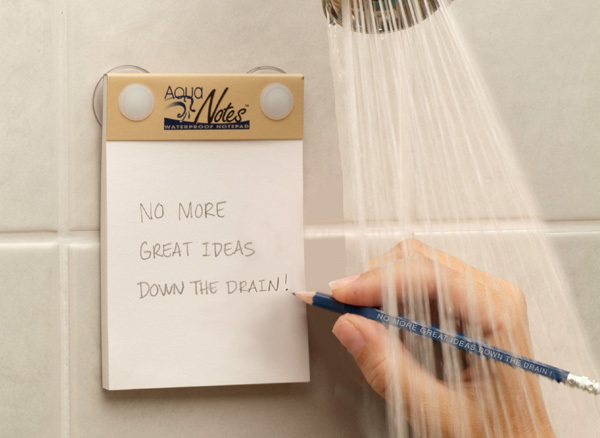 Aqua Notes are waterproof notepads with suction cups on the back that allow you to quickly jot down ideas, notes, lyrics, plans or sweet nothings while enjoying your Amazon Rainfall Massaging shower head.